The Gleason Foundation donated $3 million to RIT’s growing engineering college. In the last year, the Kate Gleason College of Engineering added new degree programs in chemical and biomedical engineering. Above, students in the chemical engineering program work closely with Professor Brian Landi on projects investigating electrochemical capacity in lithium ion battery technology. The Kate Gleason College of Engineering at Rochester Institute of Technology continues to enhance its status as one of the top engineering colleges in the nation. In recognition of that effort, the Gleason Family Foundation has committed $3 million to the engineering school to create the Gleason Family Foundation Faculty Development Fund. The gift will be used to recruit and hire talented faculty for the newly established chemical and biomedical engineering degree programs and to assist the new faculty as they establish laboratory facilities and resources for student learning and research. 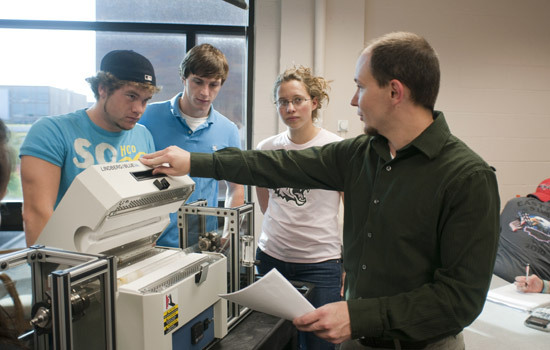 The chemical engineering program was launched in 2009 and currently has more than 120 students enrolled. The biomedical engineering program, recently approved by the New York State Department of Education, welcomed its first class of nearly 40 students this past September. The chemical engineering program emphasizes critical areas such as nano-scale engineering and alternative energy, while the biomedical engineering program focuses on systems biology and engineering analysis for the biomedical industry sector. The Gleason family, its foundation and company, Gleason Corp., have been long-time supporters of RIT and the engineering college. In 1998, the college was named after Kate Gleason, one of the first female engineering students in the nation and the first woman to be granted membership in the American Society of Mechanical Engineers.